As a person who has been evaluating and working on politicians’ credibility for more than a generation – and teaches a course on that subject – I know that it is not what a person says, but who says it. President Trump’s State of the Union Speech is a prime example of the problem. 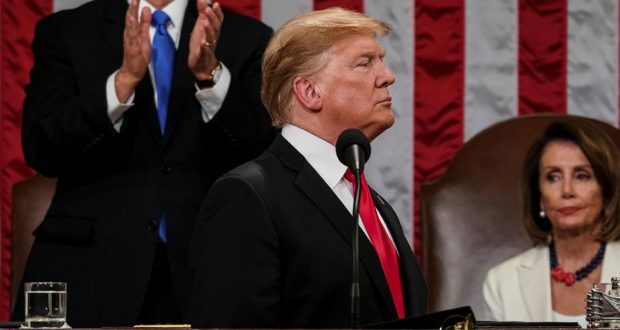 If you were to read or hear his speech without Trump’s history of dubious credibility, it would be highly praised and well received by the vast majority of the American people. He spoke to what most of us believe. For sure, there were a few controversial issues, but even in those, he had the right resonating tone. His condemnation of late-term abortions – and now even the Democrats embrace of postpartum infanticide – is consistent with the beliefs and opinions of the vast majority of the public. Without prior understanding, the viewing public would be shocked and dismayed to see all those women in white NOT applauding Trump’s call for an end to the grisly practice. His calls for America’s withdrawals for the fields of battle resonates with war-weary Americans. Most feel that we have lost too many lives and too much treasury to what is seeming like a modern-day version of the Hundred Years War that took up much of the 14th and 15th centuries in Europe. Most of us see and feel the current success of the American economy. It is borne out in virtually all the statistics – unemployment rates, increasing wages, economic growth and job creation. Trump free-market policies have improved economic conditions in both the black and Hispanic communities for the first time in more than 100 years. And, we see the need to stop illegal migration – even if that means some physical barriers here and there. Trump’s plan for using different means and methods to finally secure the border as a reality – not the same old lip-service desire of the past administrations. Building up our own military in the face of Chinese and Russian advances is common sense – and getting our NATO allies to cough-up more for their own defense is a winning accomplishment by any rational measure. Trump was interrupted by applause more than one hundred times in his one-hour and twenty-minute oration. – many times, with the participation of those on the Democrat side of the aisle. For sure, the speech was designed to get the audience on its feet, but it still had visual impact. Trump gained more subtle points as cameras revealed the negative facial expression and body language of Democrats. Senator Minority Leader Chuck Schumer looked particularly smarmy. California Senator Kamala Harris appeared to be willfully expressing her disgust at portions of the speech that seemed most appealing to the general public. And Speaker Pelosi was seen tamping down possible negative reactions from Democrats – much like a schoolmarm silencing rowdy students. For those without knowledge of Trump’s personal presidential history, the selection of everyday Americans to be highlighted for exceptional contribution was extremely effective. Most moving was the presence of a daughter and granddaughters of to elderly people murdered by an illegal alien and the side-by-side appearance of a man imprisoned in Dachau and a man who was part of the contingent that liberated him. Then there was Alice Marie Johnson, a woman pardoned by Trump — a woman, incidentally, who struck me as looking like a sibling of Democrat responder Stacey Abrams. So … why would Trump’s speech not be overwhelmingly well received by public and pundits alike? The reason is credibility. Destroying opposition credibility has been a mainstay of Democrat strategy. They did it with John McCain in 2008 and Mitt Romney in 2012. They apply their method-of-operation against the Republican Party in general and conservatives more specifically. Rather than rebut Trump on the issues, the #NeverTrump Resistance Movement in the mainstream media went after his vulnerable credibility. As might be expected, one of the leads was MSNBC’s Nicole Wallace who proclaimed that Trump did not mean a single word he said. It was all a lie. The hardline left-wing anchor went so far as to say that Trump did not care at all about any of those people he highlighted in the gallery. CNN’s Van Jones said Trump was serving up “poop and cookies.” And Morning Joe was another production line of anti-Trump negative interpretation. The reason this strategy works is that Trump himself has aided and abetted his adversaries by putting his credibility regularly on the chopping block with gross exaggerations and more than accidental inaccuracies. In view of all that, the speech will do nothing to unify much of America – although it was good enough to get a slightly more positive response for the general public. It was a win for Trump in a political climate where wins are rare – on either side. It did the job, but it is not a very critical job. Trump could have invoked President Lincoln’s line from the Gettysburg address – “The world will little note, nor long remember what we say here.” In Trump’s case, it probably would have been accurate. I disagree with your conclusions. The left-wing media and Democrat party rule the airwaves – Middle America totally gets, understands, and agrees with the President. He is out there alone, fighting like a surrounded boxer, taunted by his enemies on every side for trying to do what it right for the nation, and not any party label. He will fight to the end and is ALWAYS three steps ahead of the oppostion. He will go down as a great President once he concludes North Korea, Midddle East, & Economic problems he inherited from the feckless politicians on both sdes. Give him some slack, no one else does. Jealousy becomes hate and that is what we have here. The democrats are much more interested in destroying Trump than they are in caring for Americans. They will fail. Donald Trump is purposely antagonizing them because he can get more things done while they are distracted with their “destroy Trump at all costs” campaign. They have no policies other than “tax the rich” and “kill babies right up to the moment of birth.” They are now starting their own infighting. Even intelligent democrats I know are smitten with this blight. I have no idea what they think they are gaining. It makes no sense to me, and as an editor, I try to understand what’s going on. This has me beat. NBA Wants to Assess Integrity Fee on Bets: Seriously? NBA and Integrity?